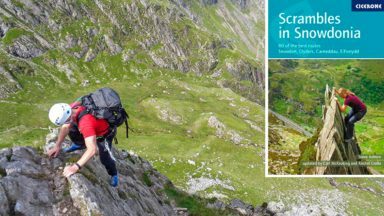 This inspirational guidebook describes 40 superb routes among the valleys and heights of the Snowdonia National Park, inviting walkers to explore the less well-known regions of Snowdonia as much as those that are eternally popular. 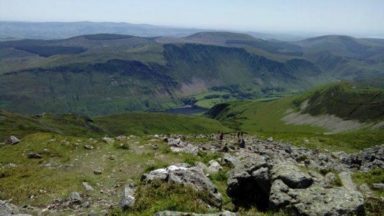 These walks have been chosen to encourage experienced walkers and mountaineers to try something new in this much-loved region, while at the same time offering clear descriptions of classic routes for those new to Snowdonia. All the routes in Great Mountain Days in Snowdonia are day walks – graded from moderate to arduous to help you choose the right route – and all of them make for a great day out in Snowdonia, whether in the ice and snow covered winter or during long summer days, the walks in this guide can be enjoyed all year round. This is the second title in the Cicerone Great Mountain Days series, which include the Lake District, Scotland and the Pennines. To aid visualisation, routes are depicted both as line diagrams and as customised HARVEY maps. The former, drawn by Lakeland author and artist Mark Richards, give an aerial perspective of the walks, while the latter pinpoint the key detail covered in the route description. HARVEY maps owe their origins to orienteering, and their bold symbols and distinctive colours make them well suited to outdoor use. Note that key landmarks that feature on the maps and diagrams appear in bold in the text to help you plot the route. Although the guide contains map extracts and diagrams, you are strongly advised always to take with you the relevant sheet map for the route, not only for safety reasons, but also to give a wider picture of the landscapes you are walking through. 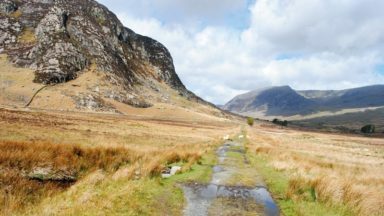 At present, HARVEY publish three 1:25,000 Superwalker maps of Snowdonia; Snowdon and the Moelwynion, the Glyderau and the Carneddau, and Snowdonia South, covering the Rhinogs, as well as a 1:40,000 British Mountain Map Snowdonia. 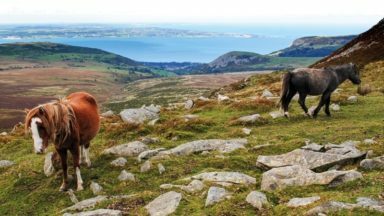 Alternatively, the following 1:25,000 Ordnance Survey Explorer maps cover the areas described: OL17 Snowdon/Yr Wyddfa, OL18 Harlech, Porthmadog and Bala and OL23 Cadair Iris and Lyn Tegid. There is a correction to the map in Walk 17 on page 103. The route description is correct but the marked route on the map after Llyn Bychan is wrong. 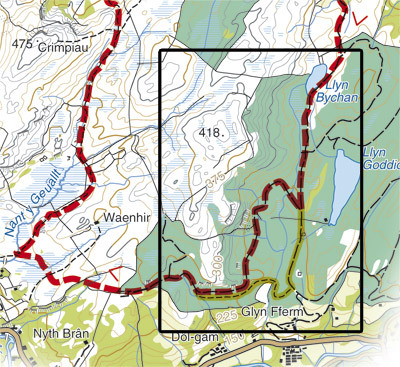 You should take the first track on the right after Llyn Bychan (indicated correctly by the dashed red line on the detail map below) not straight on along the main forest track as indicated incorrectly on the map (see solid yellow line on detail map below). Please download the corrected pdf page here. Changes to route description on pages 146 and 147, Moelwyn Mawr. "Behind the main quarry buildings is a large and wet tunnel into the hillside, and beside it a slaty ramp by which you gain higher ground (resist the temptation to enter the tunnel). The ascent passes tiny Llyn Croesor, which looks forlorn among so much darkness, but with the sun in its heaven, Llyn Croesor sparkles with the best of them. Once above the ramp, you eventually arrive at a large reedy area framed by spoil that has been shaped into a trackbed. Off to the left, Moel yr Hydd looks inviting, but the easiest way to it means trekking far off-route beyond the quarry site to a low col to the south-west of the summit and walking easily up from there. The direct ascent of Moelwyn Mawr bears right from the reedy area, following a clear if damp path towards a ladder-stile, which is not needed, as the path passes to its left, and follows a clear route onto the shallow north ridge of Moelwyn Mawr and then steeply up to the squat and tidy trig pillar on the summit, trending right near the top. 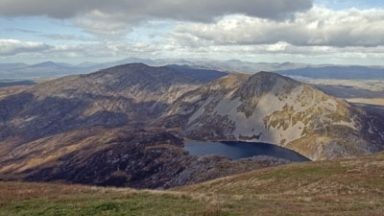 It is possible to count fifteen or more lakes from the top of Moelwyn Mawr, and the view, notwithstanding the dereliction, is one of the finest in Wales for extent, beauty and diversity. The continuation to Moelwyn Bach will call for some thought. 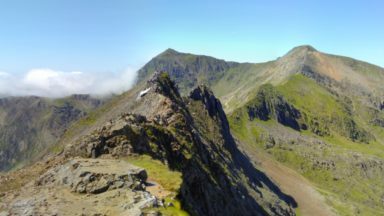 Begin by going east from the trig, but only for about 100m, and then turn right and descend the south ridge in a series of rock steps, crossing the subsidiary summit of Craig Ysgafn, marked by a large cairn. Above, Moelwyn Bach’s crags look impenetrable and shaky, not so much a scramble as a crumble. They are avoided them by ascending a clear path diagonally left which leads to the grassy eastern spur of the mountain from where the summit is readily attained."